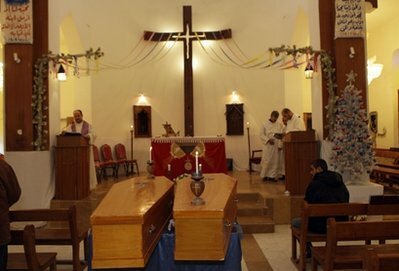 BAGHDAD, Iraq — The latest bloody attack on Iraq's Christians was brutal in its simplicity. Militants left a bomb on the doorstep of the home of an elderly Christian couple and rang the doorbell. When Fawzi Rahim, 76, and his 78-year-old wife Janet Mekha answered the doorbell Thursday night, the bomb exploded, killing them, Mekha's brother told The Associated Press on Friday. Three other people, apparently passers-by, were wounded. "When I went there, I found both of them cut to pieces near the gate of their house," said the brother, Falah al-Tabbakh, 47, who had been at a funeral nearby in the eastern Baghdad district of Ghadir. He rushed to his sister's house after neighbors called him, and they told him what happened, he said. 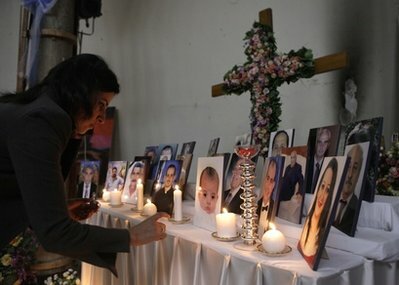 The bombing was among a string of seemingly coordinated attacks Thursday evening that targeted at least seven Christian homes in various parts of Baghdad that wounded at least 13 other people, a week after al-Qaida-linked militants renewed their threats to attack Iraq's Christians. The attacks are the latest since an Oct. 31 siege of a Baghdad church by al-Qaida killed 68 worshippers, terrifying the minority community, whose numbers have already fallen dramatically in the past seven years of violence in Iraq. The repeated attacks have infuriated many Christians who question why the government seems unable to protect them despite its repeated promises since the church siege to do so. 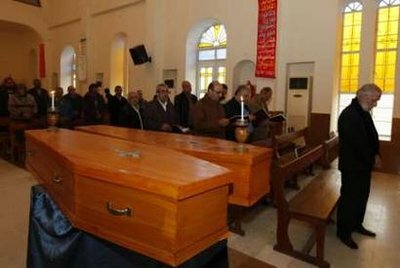 "The Christians in Iraq are always targeted because they do not have militias and they do not believe in the power of weapons," said Father Nadhir Dakko, a priest at St. George Chaldean Church, who performed the funeral service for the slain couple. Speaking to reporters after the service, Dakko railed against what he called the government's inability to "establish peace and security" for all Iraqis, Muslim and Christian. All Iraqis are suffering, he said, but the situation is harder for Christians because they are a minority. "Iraq is bleeding every day," he said. The government, while calling on Christians not to flee Iraq, has beefed up security around churches and dispatched extra police patrols in Christian neighborhoods. They've placed concrete blast walls around the Our Lady of Salvation church where the siege occurred. Still, authorities and Christian leaders have acknowledged that security forces cannot protect every single house, and asked Christians to be vigilant. Violence has gone down across the country the past two years, but the government still struggles to protect even its own police forces. Iraq's violence has struck all its various religious groups, and hundreds of thousands have fled the country since the 2003 U.S.-led invasion. But the ranks of Christians have been particularly depleted, in part because their numbers were not large to begin with — estimated at 1.4 million before the war. Now an estimated 400,000 to 600,000 Christians are left, according to a recent U.S. State Department report. 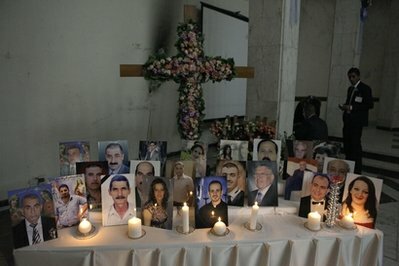 On Friday, the U.S. State Department condemned the recent violence against Iraqi Christians and praised the Iraqi government for trying to increase security for the Christian community. "We call on the government of Iraq to redouble its efforts to protect Christians and apprehend the terrorists who are behind these acts," said the statement released by acting State Department spokesman Mark Toner. The Ghadir district where the elderly couple were killed shows the signs of the flight. In the past its population was predominantly Christian, with some Sunni Muslims. Both communities have fled in large numbers since 2003, and many houses have since been bought by Shiites from the nearby Shiite stronghold of Sadr City. Al-Tabbakh said his sister's children had left Iraq even before 2003, but that his sister and her husbands were holdouts, determined to stay in their homes. "Today, we stand next to two martyrs whose crime was that they preferred to stay in their country," Dakko, the priest, told the congregation in the funeral service. Christians have been targeted in the past. But the October church siege was the deadliest ever, and it was followed by several dire warnings from al-Qaida's branch in Iraq that it intends to directly target the community. That prompted several thousand Christians to flee Baghdad for the relative safety of the Kurdish-run north in the past two months. Father Mukhlis, a priest at Our Lady of Salvation church, the target of the October siege, said as many as 12 violent incidents occurred against Christian homes across the capital Thursday night. Police officials confirmed seven attacks against Christian homes. They and hospital officials confirmed the deaths of Rahim and Mekha and 13 wounded in the various attacks. All officials spoke on condition of anonymity because they were not authorized to speak to the media. In the other attacks Thursday night, four bombings targeting Christians wounded six people. A stun grenade landed inside a Christian house in the Dora district in southern Baghdad, injuring three others, and a rocket hit a Christian home in downtown Baghdad, wounding one person. There was no immediate claim of responsibility, but such attacks have generally been the work of Sunni militants linked to al-Qaida. Deputy interior minister, Maj. Gen. Ahmed Abu Ragif, blamed Thursday's attacks on "terrorists who expressed hatred of Iraq in general and of the Christians in particular," Ragif said. 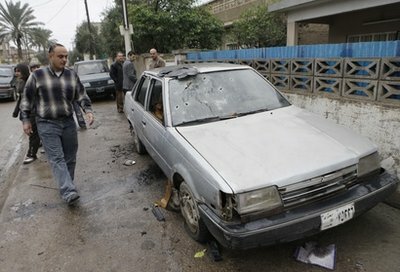 The assailants' aim was to "prevent our Christian brothers to celebrate the New Year," he added. At the Our Lady of Salvation church, both Christians and Muslims gathered Friday morning in a show of solidarity and to see a play performed by Iraqi actors about a woman whose son is killed in the church siege. One Muslim woman said she wanted to demonstrate to the Christian community that they are not alone. "What has happened in this church was so painful to all of us. We wish that we died instead of them. Those who plan to steal Iraq won't succeed because we all share joy and sadness together," said Hiba Shihab. Saad Abdul-Kadir contributed to this report.